Summer is a fabulous time of year to increase your hand-painted and dyed fabric supply for a couple of reasons. Firstly, you can work outside and not get things inside your house messy. Secondly, you can work outside and it’s an excuse to be outside AND working at the same time. 100% cotton gives the best results. A high thread count gives crisp lines and good colour. I find that 100% cotton sheeting or quilt backing works fabulously and generally purchase mine in the fabric section of Wal-Mart. man-made satin can be interesting, but iron it only lightly or it will melt! It is therefore not as colour-fast as cotton when finished. Silk is fun and gives a softer texture to the finished work. Iron on the appropriate setting. Silk organza and satin are very rewarding (but expensive). Threads and laces and cording made of natural fibres can also be painted, but their “hand” may be altered. Paint embellishments for a project at the same time as you paint the main fabrics and using the same paint mixes, so that they go together well. corrugated plastic comes in 4 x 8 foot sheets and is great for stretching and pinning fabric in preparation for painting. keep a set of “painting pins” and “painting scissors”, so that your good ones don’t get covered in goop. Consider a painting iron too, especially if your husband regularly uses your sewing room iron to iron his white dress shirts. Generally, wash your fabric first, dry it in the dryer and iron it to mostly flat. Set-up is very important – protect your home, garden furniture and clothes from splatters! Paint a piece bigger than you anticipate needing, if you are painting for a specific work. Water acts as a lightener. Think of it as your “white”. The faster fabric dries, the darker the colours will be. Paint bleeds on fabric, no matter how careful you are. It will bleed more readily into damp areas. To increase bleeding, spray the area with water. To prevent, do not moisten fabric. Resists can help to contain areas. For large quantities of fabric, consider baking the results instead of (or as well as) ironing them. Don’t iron a piece before it is completely dry. Keep your test pieces and label them with a fabric pen for your first few sessions. They will act as your “cheat sheets” in future projects. Fabrics will often turn out radically different from your preconceptions and intentions. Trust in serendipity. What you leave to dry and what results may be different things. Any ripples in the fabric will show in the results. skies are darker higher up than they are towards the horizon. Paint the top of the fabric, and allow the paint to bleed into the horizon (tilt the board to help). Allow to dry slowly for best results. Start with yellow, add pink, move to blue. Allow them to bleed into each other. Dry flat. Paint in warm or hot conditions. The hotter and drier the weather, the stronger a sunset you will have. Tinge colours with their opposites on the colour wheel. Yellow tinged with purple, blue tinged with orange, etc. Only a drop of the opposite is needed to make the colour richer. Sun painting works best in warm, dry weather. Only the Pebeo Setacolor transparent paints can be used for sun painting. Try other materials for shadows in sun painting – flower petals, grass, etc. all give different effects. Pearl shimmer paint and opaque paints can be used over top of transparent and will cover the lower layers. Thank you! What awesome information! I can’t wait for the rain to stop so I can go out and play with paint!!! Oh! 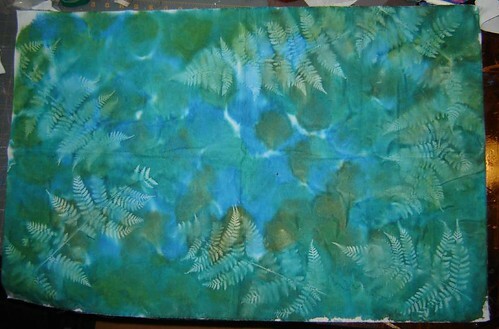 I am new to this world–trying to make gorgeous fabric, and I think your piece with the ferns and the leaves is SOOOO beautiful! And clues as to how you achieved that layered look? I’ll be sure to visit your blog often. It’s quite an inspiration! Thanks everyone who visited and left comments! Judith, have you tried using a resist to outline the areas that you want to fill in? The less water you add to a setacolor paint, the less bleeding there will be. Dry fabric also bleeds less. Experiment with painting on dry cloth and undiluted paints. Try using a stencil brush and stippling the paint on. A hot summer’s day or a warm, dry house may help to speed up the drying time and, hence, reduce the bleeding. If all else fails, you may need to switch to another acrylic-based fabric paint that bleeds less for your purposes. Jean – the layered look is achieved by mixing two or three paints and applying them one at a time with a sea sponge, making sure to form a distinct (yet complementary) pattern with each. For instance, paint one is a light yellowy-green. Dab it on randomly throughout, leaving lots of white space. This is the background layer. Paint two is a darker green. Use this to form an irregularly-sponged frame. Paint three is the darkest and is used to highlight certain parts of the frame formed by paint two. Each layer has it’s own colour and is added in sequence. Thank you for this information, I’m just starting to experiment for a uni course so this will be very handy. thankyou for the information i cant wait to experoment with my own design when the wether is better. p.s Thankyou your tips are useful i would hate to make a mistake but i sopose you do ones in a while but thats the fun of it. This is great I have tried this before and on many occasions ruined it belive this or not while ironing it, I can never get it right and always have the irons that little bit too hot or use it for a little too long, I know it must be my fault but how to you get out creases without damaging it. Thanks for the information. I am a newbie to silk-painting. I prefer to paint without Gutta. I do not like the separation lines it leaves between colours. At the moment I paint with serti. I like the paint. I love to try the sunpainting as I live in Bali,Indonsia. I need for that the transparent paint. What a wonderful blog this is. I just felt I had to leave a comment to congratulate you on the work you have done. I will definately come back and will also let my friends know about your blog. I do not have a website, ihope that i can still blog here. i do have a project to start and am looking forward to doing some of it in landscape and the rest in applique. it is a quilt project to launch a childrens story book line. my husband is the author. the story depicts a trip to blue mountain where everything encountered is quite blue even the food and the visitors become blue. To design a quilt with so much of one color will be challenging, i plan to add opposites for contrast like orange and yellow and will be using blues from cobalt to sky w/lavendar in there somewhere. your hints have been great inspirationa nd your site is getting a bookmark for sure! will visit again and keep posting my progress. Looks wonderful~ I wonder how stiff the fabric is in the end? 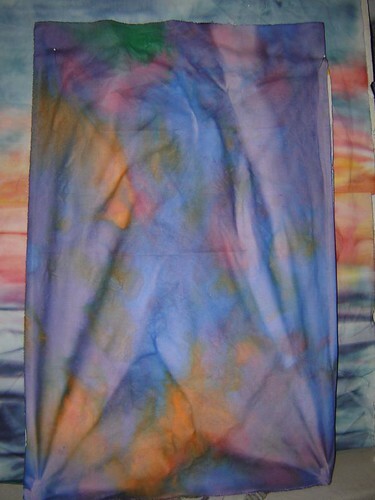 My image of fabric paints hasn’t developed since elementary school, so I don’t know how flexible the fabric is at the end! Hello everybody. Is it possible to start fabric painting as a business from home. I am living in Palakkad district of Kerala state. Any advice how to sell my fabrics? Thanks to all in advance.